Whatever you want from a holiday you will find in Tuscany. Incredibly beautiful landscapes; rows of cypresses, serried vines and olive groves, hilltop farmhouses, gently rolling hills.... Historic towns and cities, miles and miles of beaches.... and of course the gastronomic delights of the local food and wine. 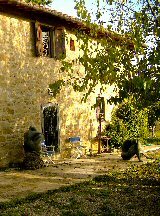 Villa La Sorgente is a privately owned property in one one of the most beautiful areas in Tuscany. Surrounded by magnificent, undulating countryside and ideally located for exploring the nearby towns, villages and cities such as Florence, Siena, Pisa, Carrara, Arezzo, St. Gimignaino, Fiesole and many more. How better to know and appreciate all this than from your own home away from home. Fly from your local airport and hire a car or drive yourself leisurely through Europe to arrive relaxed and ready to enjoy Villa La Sorgente. Approximately 1½ hours from Pisa airport and 15km from the Incisa exit of the Autostrada Del Sole motorway. Near to the major seaside resorts of Viareggio, Forte Dei Marmi & Carrara, all easily reached and enjoyed on a day trip; and just a short drive to Valombrosa and Saltino, ski resorts about a thousand metres high with the most fantastic views over the Val d’arno.